How to avoid catching contagious diseases | Kate Mahar writes . . . According to Chicken Little, the sky is falling in Northeastern Ohio. No, I am not making light of something as scary as the Ebola virus. Well, maybe I am. Just a little. There’s just so much misinformation and drama, it’s making me feel irreverent. Want to know more about this virus? Read this transcript from Public Radio International’s The World program called “Here’s everything you wish you didn’t need to know about Ebola,” produced by Christopher Woolf, then meet me back here. So one positive thing about Ebola is that it isn’t airborne. That means that all the people on that Frontier flight could NOT catch it by breathing the same air as poor Amber Joy Vincent. In fact, unless Amber was spitting at people (pretty sure she wouldn’t do that) or rolling around in the aisle forcefully french-kissing strangers (again, not likely). no one had the opportunity to ingest any of her bodily fluids, which is the only way to catch the disease. Every time you leave the house and touch anything, and I mean ANYTHING, anywhere – don’t touch anything from the neck up until you have had a chance to get home and thoroughly wash your hands. Since it’s easy to forget that, here are some suggestions to help you keep your paws out of your mouth, nose and eyes until you’ve cleaned up. It may be hard to remember NOT to touch your face. 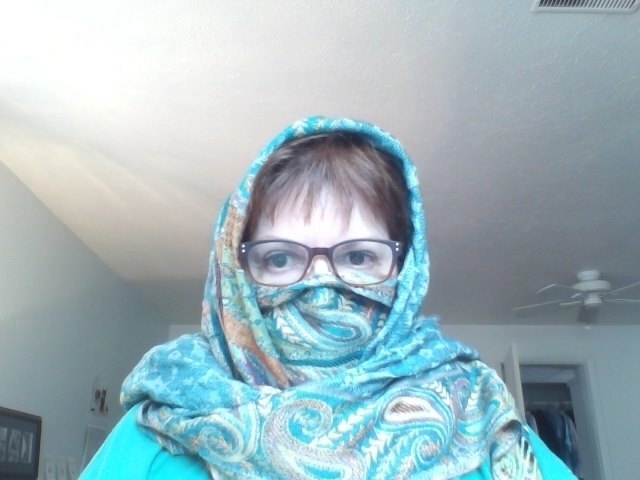 If you don’t normally wear a burka, you could still take a practical Middle Eastern approach to avoiding germs by wrapping as much of your face as possible with a large scarf like this one. 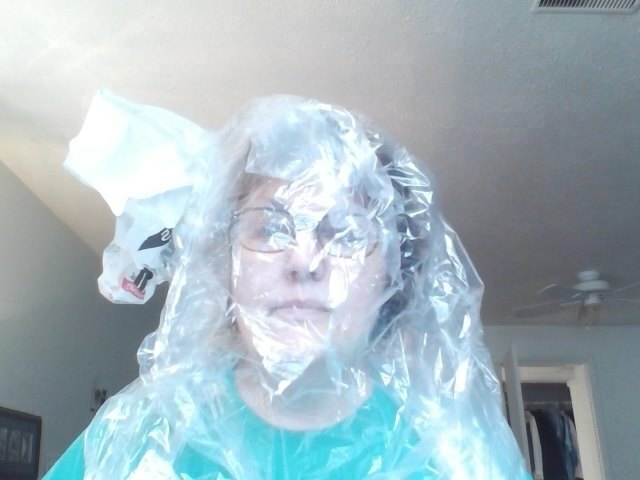 In a pinch, you can throw a dry cleaning bag over your head. Don’t try this with toddlers. 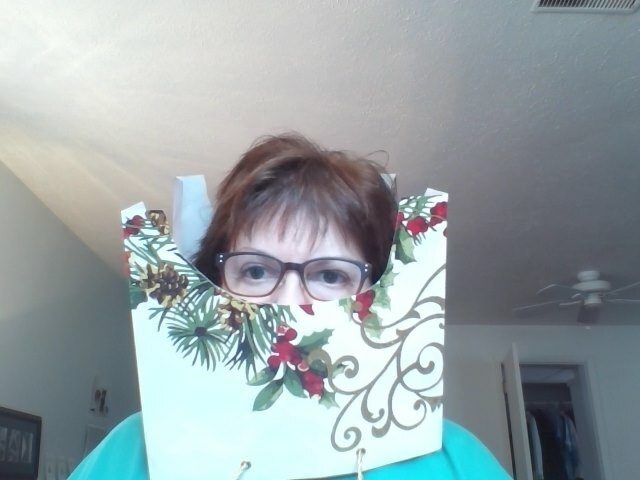 Or my personal favorite, create a “cone of shame,” much like used for pets, out of an old gift bag. Easy, functional and not as hot as wearing a bag or scarf around your head. Do not run a bunch of errands then swing by McDonald’s and stuff fistfuls of fries in your maw on the way home. What are you thinking? What are you smearing all over that food with your dirty paws? Not to mention, what kind of crap are you eating, anyway? Do not poke around in your eyes or rub them. Where have those fingers been? Do not pick your nose. And if you wash your hands, then pick your nose, please wash your hands again before we meet later, okay? If you have little people in your house or anyone who you may poke, prod, feed, etc., don’t do any of those things to THEM before you’ve washed your hands, either. Don’t think because you were “careful” that you’re probably okay. How many times have you seen someone wash their hands in a public restroom, then open the door to leave with that “clean hand?” Really? Now your hand is only as clean as the hand of the person before you who may or may not have washed after their little visit to Mr. Potty. Speaking of hands, you could wear disposable gloves. No, I am NOT going to touch icky stuff with my adorable paisley gloves. Then I’d have to throw them out! 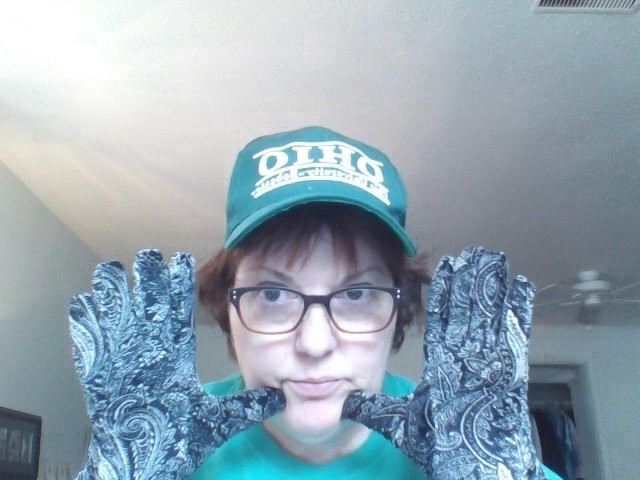 And disposable gloves look kind of creepy, so I’ll stick to hand washing. And one last thing before I go. Do you know HOW to wash your hands? I recorded detailed instructions but I can’t figure out how to upload that kind of file. Oh, well. Use warm water and soap. Don’t forget your thumbs! Wash and scrub while you sing the ABC or Happy Birthday song so you know you’ve spent enough time sudsing up. And that’s it. Don’t panic. Be smart. Wash your hands. 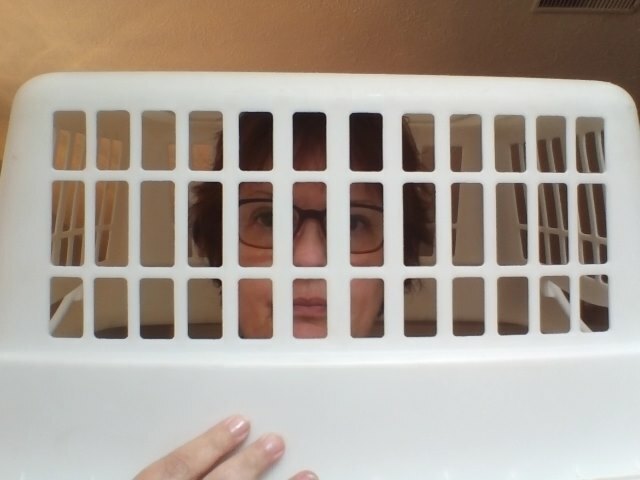 This entry was posted in Uncategorized and tagged CDC, Ebola, Frontier, hand washing, nurse, PRI, safety, virus. Bookmark the permalink. Oh stop, you made me pee and gave me my idea for a Halloween costume! This is hysterical! It’s gray and gloomy in LA and you’ve got me cackling joyfully at my computer. Truly a LOL post! Thank you, Jane! Looking forward to learning more about your workshop. Have a great weekend (it’s gloomy here in NE Ohio today, too)! Hahahaha! My laugh of the day! Love your photos especially the cone of shame! How fun!